From its green valleys spread with vineyards to its old churches and watchtowers perched in fantastic mountain scenery, Georgia (Saqartvelo) is one of the most beautiful countries on earth and a marvelous canvas for walkers, horse riders, cyclists, skiers, rafters and travelers of every kind. Equally special are its proud, high-spirited, cultured people: Georgia claims to be the birthplace of wine, and this is a place where guests are considered blessings and hospitality is the very stuff of life. 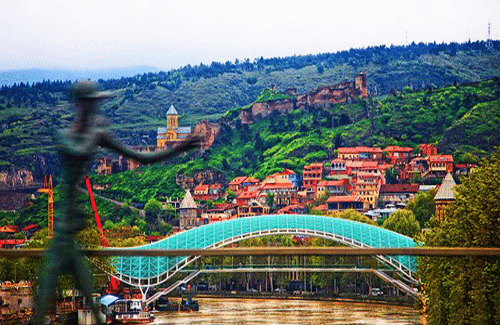 In this tour package you will have a possibility to travel and see places like: Tbilisi with it’s most famous touristic destinations, Mtkheta, Svetitskhoveli cathedral, Jvari Monastery with the breathtaking views on the rivers Kura and Aragvi, Uplistsikhe rock-hewn town, Kakheti region where you can taste the best wines of Georgia and with it’s most beautiful city of love Signaghi, Tsinandali – A. Chavchavadze Museum, Bodbe Monastery Complex and afterwards in the mountains, Kazbegi / Stepantsminda and Geregeti Trinity church on the pick of mountain with unbelievable views on Caucasus mountains and on the road Zhinvali water reservoir, Ananuri Fortress, Dariali Gorge.